Grapeseed oil is rich in vitamins, antioxidants and emollients. It doesn’t leave hair feeling greasy. It restores strength and shine of weak, brittle hair. It nurtures skin cells and promote blood flow. Grapeseed oil is one of the best natural ways to boost hair growth. Extracted from cold-pressed grape seeds, grapeseed oil is used in cooking, cosmetic manufacturing and medicinal benefits. Besides using grapeseed oil in the kitchen, you can use it to treat hair problems. Grapeseed oil is quite effective as a hair moisturizer and conditioner. Moreover, it also addresses hair problems, such as weakened hair, hair loss and dandruff. The production of dihydrotestosterone (DHT) is one of the causes for hair loss. Grapeseed oil contains antioxidants that block production of this hormone. Furthermore, grapeseed oil promotes relaxation of the hair follicles to prevent hair loss caused by the stress hormone ‘cortisol’. If you are experiencing hair loss, here’s how you should use grapeseed oil for hair growth. Combine a teaspoonful of grapeseed oil with a teaspoonful of jojoba oil. Wrap a towel around your head and leave it overnight. Wash it out with a gentle shampoo in the morning. Do it twice a week to promote hair growth. Grapeseed oil is thin in consistency and therefore, doesn’t leave hair feeling greasy. It is odourless; there would not be a lingering scent after you have used it. It locks in moisture, prevents split ends and brittle hair. It gives hair a deep-conditioning treatment. You can treat dandruff, dry scalp and flaky scalp with grapeseed oil. The oil has emollients and nutrients that nurture skin cells and promote blood flow. 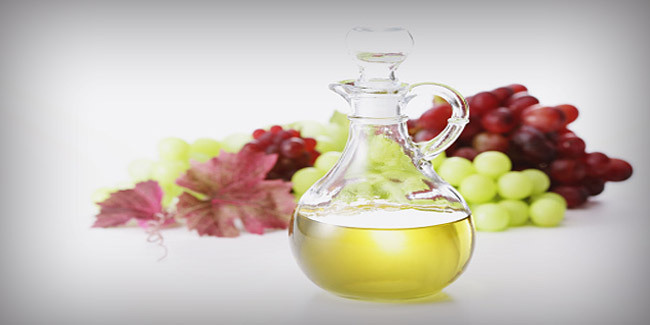 Grapeseed oil contains vitamin E which builds tissue and lineolic acid to hair growth. Grapeseed oil can restore strength and shine of weak, brittle hair. Not happy with your hair? It is time to try grapeseed oil to get stronger, healthier and more attractive hair.